Note : As of now, same mobile number and E-mail can be used to get multiple voucher code. It may be stopped anytime. 5. Done !! Add it to your Amazon account. This offer entitles the end user Rs. 40 Amazon Pay Gift Voucher on www.amazon.in / Amazon Mobile App. 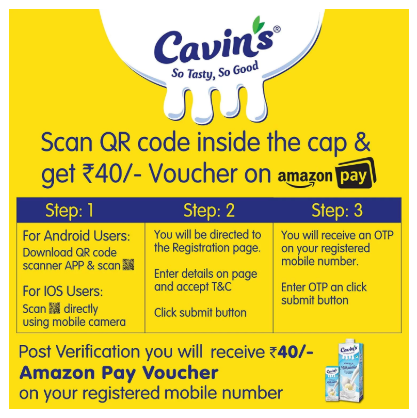 Offer is Valid for transactions made on amazon.in or on the Amazon App. In no event, shall the maximum liability exceed the value of the coupon. If you are not a Amazon registered customer, you will be required to register on Amazon website or Amazon Mobile App to redeem your Amazon Pay Gift Voucher. In the event of any fraud detection Amazon reserve the right to modify/change, discontinue, terminate, withdraw the Offer at any time during the Offer Period. In no event shall Premier Sales Promotions Pvt Ltd or its partner agency be held liable for any issues relating to the redemption of the coupon /voucher including redemption request not being honored by Amazon. Purchases are deducted from the redeemer’s Gift Card balance. Any unused Gift Card balance will remain associated with the redeemer’s Amazon.in account and applied to purchases in order of earliest expiration date. If a purchase exceeds the redeemer’s Gift Card balance, the remaining amount must be paid with by credit card, net banking or debit card.